Nuclear energy can power millions of homes without emitting significant pollution, making it an attractive alternative to burning fossil fuels. But mining the uranium to power nuclear plants can produce political division, racial injustice and environmental degradation. Indigenous tribes still suffer from horrific health problems and lingering contamination to land and water as a result of the last uranium boom, which fueled the nuclear-arms race of the Cold War. As a result the Navajo, Havasupai and Hopi peoples have banned uranium-mining on their lands and are fighting mines proposed on their borders. But elsewhere, uranium is experiencing a resurgence. Near the Grand Canyon, a mine known as Arizona 1 symbolizes the struggle between demand for the relatively clean energy of nuclear power and the desire to protect our health and natural heritage. The mine has approval from the BLM, and is touted as a new domestic energy source and an opportunity for jobs. But it is being challenged by environmental groups who say its permit has long expired and that it should be re-evaluated based on new ecological circumstances and scientific information in the sensitive Grand Canyon watershed. “The legacy of past uranium-mining still lingers as deadly contamination of land and water near the Grand Canyon, and to think that new mining will yield different results is foolish and irresponsible,” said Taylor McKinnon, public-lands campaign director for the Center for Biological Diversity, an activist group known for challenging industry and government in court. 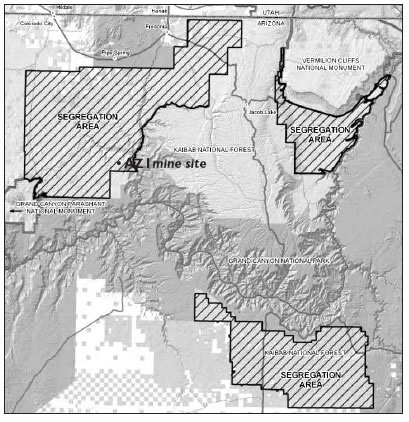 The center, along with the Sierra Club, Grand Canyon Trust and the Kaibab-Paiute Indian tribe, is suing the BLM for allowing the Arizona 1 mine to re-start without conducting supplemental environmental reviews after it sat dormant for 15 years. The traditional hard-rock mine sits on BLM lands 10 miles north of Grand Canyon National Park, and 35 miles south of Fredonia, Ariz. The ore will be trucked through a portion of the Kaibab-Paiute reservation on its way to the White Mesa Mill near Blanding, Utah. Last summer, Interior Secretary Ken Salazar issued a segregation order that bans new uranium mines for two years on nearly 1 million acres of public land surrounding Grand Canyon National Park in order to better study mining’s environmental impacts. However, mines with “valid existing rights” issued before the July 21, 2009, order — which includes the Arizona 1 mine — are exempt from the ban, a point of contention that has spurred a legal battle for public records and calls for increased federal scrutiny of mining impacts around the park. The temporary segregation order could expand to a 20- year moratorium on mining in the area, called a mineral withdrawal, depending on the results of an ongoing environmental impact statement on the region due out next year. The Arizona 1 mine, owned by Denison Mines of Toronto, Canada, had shut down because of a poor uranium market in 1992, but was revived in 2007 after prices rebounded and is operating today on the original permit issued in 1988. But environmental groups disagree, arguing in their lawsuit that the mine’s permit and plan of operation are invalid because they expired after 10 years. They say the mine’s impacts must be judged in the light of new data regarding groundwater hydrology in the area, as well as changes in the landscape such as the arrival of the endangered California condor, increased tourism and more residents. The BLM disagrees, noting that some changes were made to the permit, such as a larger reclamation bond that corresponds with current prices, and a requirement that the mine obtain an air-quality permit from the Arizona Department of Environment, which it did. But additional studies beyond the original 1988 environmental assessment (a less-rigorous analysis than an EIS) were not required and the permit to mine had not expired. As far as changes in the area, the BLM is not convinced they require additional study, not even potential impacts on the endangered California condor, introduced to the area in 1996. Are the mining claims still valid? Hochstein downplayed the environmental impacts of the smaller mine, and said it brings good jobs to an economically suffering region. The Arizona 1 mine will produce some 50 local and contract jobs, he said. The ore is being trucked 300 miles to the White Mesa Mill in Blanding, Utah, also owned by Denison. That mill, the only uranium mill operating in the country, will employ up to 130 people once it is fully ramped up. White Mesa processes the ore into yellowcake, a concentrated form of uranium that is shipped off to be processed into a gas and then into fuel rods for nuclear power plants. Denison Mines also plans to re-open two other uranium mines that company officials say have valid existing rights in the segregation area – the Canyon Mine and the Pine Nut Mine — and has mines already operating in Utah and Colorado. The BLM has eight linear feet of information regarding mines owned by Denison Mines in the segregated area, according to an agency response to a Freedom of Information Act request by the Center for Biological Diversity. “But so far we have only received about three inches of that,” said Mc- Kinnon, whose office is suing the BLM in a separate lawsuit for refusing to disclose the public records. In order to makes its case against the Arizona 1 mine, more information is needed on the original plan of operations and environmental reviews, he said. The BLM says there are approximately 10,600 claims being mined within the boundaries of the segregation order and proposed 20-year withdrawal. Salazar’s order grandfathers mines that have “valid existing rights,” a complicated legal distinction that is hotly debated and not clearcut. But BLM officials say they have discretion in deciding on a valid claim. Mine owners must have done exploration and must prove the existence of a valuable mineral deposit, a fact that may or may not be verified by the BLM, before operations can begin.